We visit London's Science Museum to see a new exhibition on robotics and discover what past mechanisation might teach tomorrow's workers. Presented by Rory Cellan-Jones. We visit London's Science Museum to see a new exhibition on robotics and discover what past mechanisation might teach tomorrow's workers about adapting to automation at work. Plus we try out a radio that claims to know your mood and play you music to suit how you're feeling, And we find out how a free data plan is shaking up India's mobile phone market and causing controversy for its rivals. Presented by Rory Cellan-Jones, with Chris Foxx from the BBC Online tech desk, and special guest Valerie Mocker, an expert in the "digital economy" at the UK innovation charity NESTA. 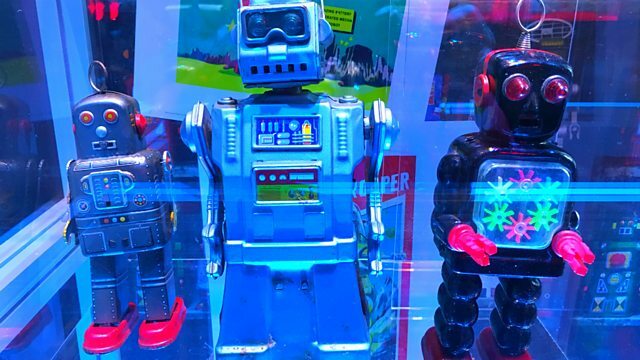 (Image: Toy robots on display at the Science Museum, London, Credit: BBC/ Jat Gill).